Timer Function: Open the case, switch the timer button to "ON", the lights will turn on in the pre-programmed timing sequence of 6 hours on, 18 hours off over each 24 hour period. Timing sequence will continue until switched off or battery power is depleted; Switch to "OFF", the light will continuous light until batteries runs out. Waterproof Level: IP65, Can be use indoor or Outdoor. 2. Please note that the battery fairy lights are not bright as 120V electric fairy lights. 3. How long the string light can be continued light depends on the quality of battery. Battery power operation: Require 4 x AA batteries (NOT include) ---60 hours continued use or about 10 days with timer function by new batteries. IP65 Waterproof: Can be used indoor & outdoor. 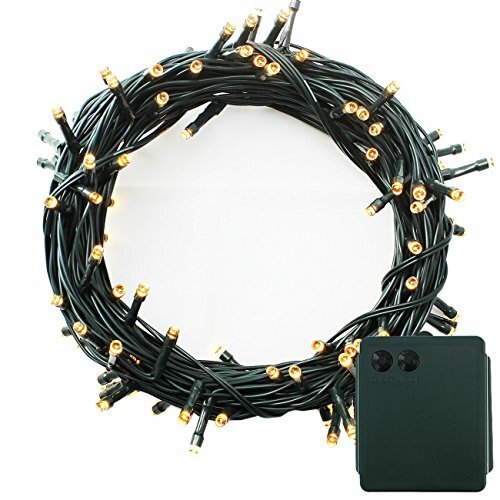 No power cord or socket required, you can decorate anywhere especially some places without power supply. If you have any questions about this product by Pms, contact us by completing and submitting the form below. If you are looking for a specif part number, please include it with your message.